Our staff is BPI Infiltration and Duct Leakage (IDL) certified. 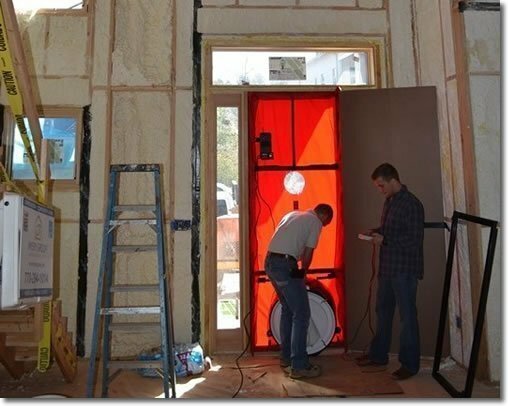 You will automatically enrolled in a companion online course that will cover the theory of Blower Door testing and includes video’s to acquaint you with the process prior to class and serve as a review for after the class. We have examples of both the Minneapolis and Retrotec systems. The basic setup and testing of a Blower Door Infiltration Test and a Total Leakage and Leakage to the Outdoor Duct Test will be covered. R402.4.1.2 Testing. The building or dwelling unit shall be tested and verified as having an air leakage rate of not exceeding 7 air changes per hour in Climate Zones 1 and 2, 3 air changes per hour in Climate Zones 3 through 8. Testing shall be conducted with a blower door at a pressure or 0.2 inches w.g. (50 Pascals). Testing shall be conducted by either individuals as defined in Section 553.993(5) or (7),F.S. or individuals licensed as set forth in Section 489.105(3)(f), (g), or (h) or an approved third party. A written report of the results of the test shall be signed by the party conducting the test and provided to the code official. Testing shall be performed at any time after creation of all penetrations of the building thermal envelope. This course will introduce you to the fundamentals necessary to pass the Building Performance Institutes (BPI) certification exam accepted by the State of Florida for Blower Door Testing. Testing for National Certification is available with an appointment. Class A/B Air Conditioning and Mechanical Contractors will be immediately able to perform testing following this course.